Gravel crunches in the one-lane drive that runs along the fencerow and past the pond. Bob, the gray Missouri fox trotter, raises his head to see who is coming down the drive, then quietly goes back to his grass-munching. At the back of the field sits a crisp white farmhouse with its silver metal roof gleaming in the winter sunlight. Chickens and guineas scatter but hang close just in case there are treats to be had. Jim and Julie Martin are on the front porch, Julie in her calico print apron and Jim in his overalls and dress coat, pitchfork in hand. OK, they aren’t really dressed that way, but everything else in this picture-perfect farm-scape is as real as it gets. Jim and Julie have taken up homestead on a little parcel of pasture and woods in the Shady Grove community near Wooster in Faulkner County. Jim’s father was born and raised just a mile down the road, so when a “for sale” sign went up on the property a couple years ago, the Martins snatched it down quickly and negotiated a purchase. 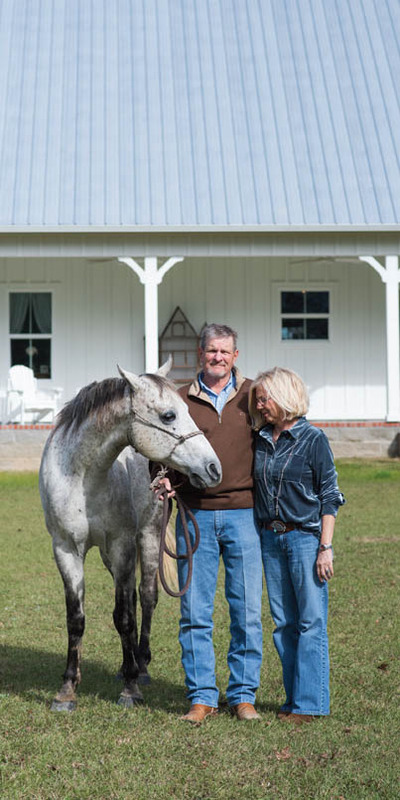 Jim and Julie Martin along with their trusty gray Missouri fox trotter named Bob take a walk around their new farmhouse. In just a few days the house was sold, and the Martins were moving to the farm. They were ready to get their feet in the dirt so they bought a camper, put their stuff in storage, rounded up the animals and headed to the land. The barn went up quickly — you know, priorities and all — and they commenced to imagining and planning their new home. The Martins maximized their space by cutting out rooms that they wouldn’t use very much like entryways, halls and a formal dining room. Using good design, thoughtful color selection, tall ceilings and lots of natural light, they were able to create a comfortable and seemingly spacious home that would accommodate them and their visiting family, in only 1,600 square feet. The Martins’ new home reminds me of the work of the sculptor who proclaimed that he simply removed every bit of stone that didn’t look like his beautiful subject. This impeccable little farmhouse has all the elements of home, and none of the other stuff that competes with that perfect feeling of homey-ness. The only things left are the things that matter. Each piece is functional or beautiful in its own right, or it has a story. 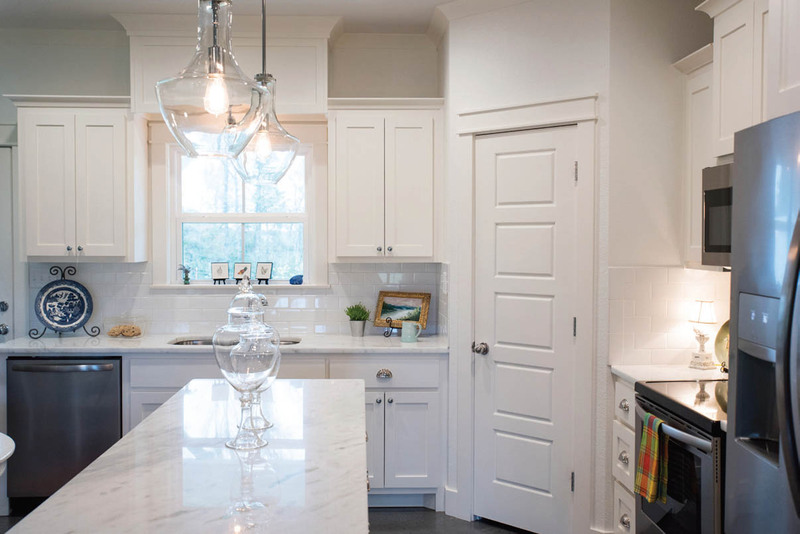 When the Martins downsized, they made sure to use their space wisely and they didn’t scrimp on kitchen space. An antique bedroom suite was purchased by Julie’s great-great-grandfather. “He must have been a man of means because he had it shipped up the Arkansas River to his home at the foot of Petit Jean Mountain. His second wife had the headboard cut down because she thought it was too tall. That tells me a little something about her, too!” Julie said with a grin. We share stories of our favorite hens of days past and their endearing personalities, with names like Helen Melon and Cornbread. We swap tales about chickens living in our homes, but Julie takes the cake when she tells of the time that her family hatched and raised 99 quail chicks in the closet! We agree that it’s easy to fall in love with chickens, but it’s best to try not to get too attached because they are fragile and will often break your heart.